Cambodia’s treatment of Vietnamese refugees sets a troubling precedent for Australia’s Catholic Vietnamese refugees. As we have recently reported, Cambodia’s treatment of ethnic minority Vietnamese refugees has put the country back in the spotlight and, as Fairfax Bangkok correspondent Lindsay Murdoch has noted, Australia’s deal to send its refugees for resettlement in Cambodia is receiving more scrutiny as a result. One thing not yet reported is what might happen to Vietnamese refugees in custody here. The ethnic minority group are apparently Protestants from the Central Highlands, part of the J’Rai group who are, according to a 2009 World Bank report, among other sources, a group indigenous to Vietnam. Protestants in the Central Highlands can suffer quite high levels of repression from provincial authorities, thanks in part to their piecemeal assistance to Americans during the war and distrust of their “illegal” home churches. Those who escaped to Cambodia allege ongoing abuse by authorities. If Cambodia repatriates them, what might the nation do to the refugees Canberra gives it? Last year there was a very steep increase in the number of Vietnamese boat arrivals to Australia, from around a hundred in 2011 to over 780 by the third quarter of 2013. It was unclear at first why they had come and groups such as the Vietnamese Community of Australia (VCA) didn’t tell me much when I was developing a piece on this story at the time, past the fact that people wanted to leave because communists are repressive. Diplomatic sources and experts later suggested they were largely young Catholic men and mostly from the one province, Nghe An, in north central Vietnam. Vietnam has the second-largest Catholic population in Southeast Asia, with some six million of its 90 million people following the faith. The Vatican and Hanoi have achieved a cautious rapprochement in recent years and religious freedom is gradually improving, although still very rocky. Nonetheless, many Catholics, thanks to black marks on their families’ histories, may be prevented from accessing education or jobs. Those whose families, for example, may have once support the U.S.-backed Catholic Diem regime of the south can still face forms of discrimination. It is also dependent on what Australian lawyer Peter Hansen, who has worked with Catholic asylum seekers before and has been in and out of Vietnam for decades, has called “ecclesiastical microcultures,” given the different Catholic groups and histories in the nation. Repression can also vary greatly between provinces and the whims of the local officials. There has been ongoing violence between Catholics and authorities in Nghe An and this, in part, explained the increase in Vietnamese boat arrivals. It was alleged last year by refugees and advocate groups that the Australian government may have allowed security officials to interview those detained in Western Australia, which terrified the detainees. This could, in fact, have been a breach of international law. The problem now may be that any Vietnamese resettled in Cambodia may be more vulnerable than most, Catholics especially. Anti-Vietnamese sentiment is an easy populist topic and one opposition politicians such as Sam Rainsy are keen to use. Ethnic Vietnamese were killed in riots this year. Prime Minister Hun Sen was essentially placed in power by Vietnam after its 1978 invasion and the two nations retain close ties. 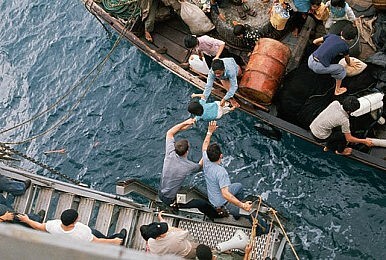 It is worth asking how safe any Vietnamese sent there for resettlement might be.